People have used painted horseshoes as a form of decoration for many years. The painted shoes can be hung outside as a good luck charm or used as wedding horseshoes. 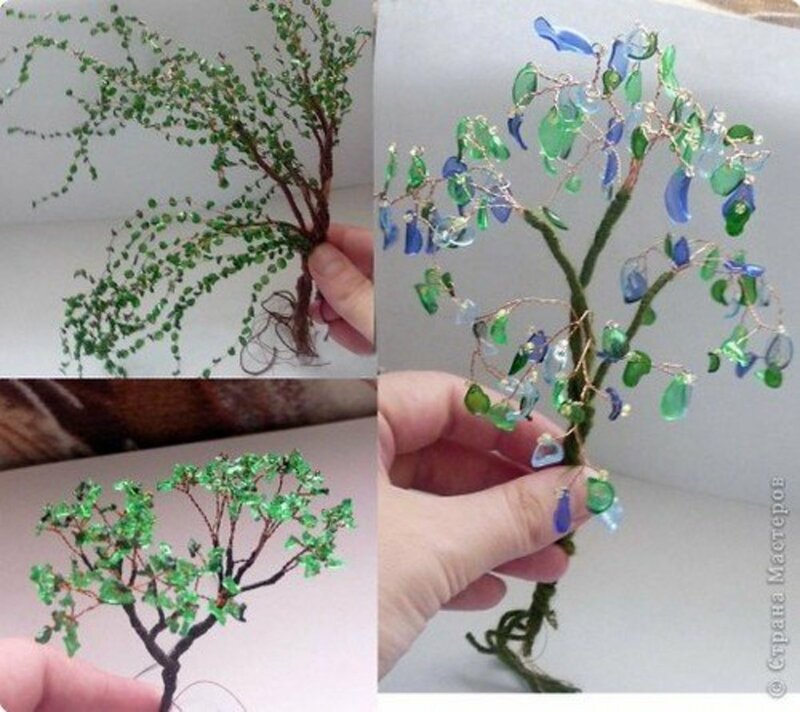 You can also personalize them to give as presents for birthdays, Christmases, weddings, anniversaries, and other special occasions. attached to the front grill of the truck. 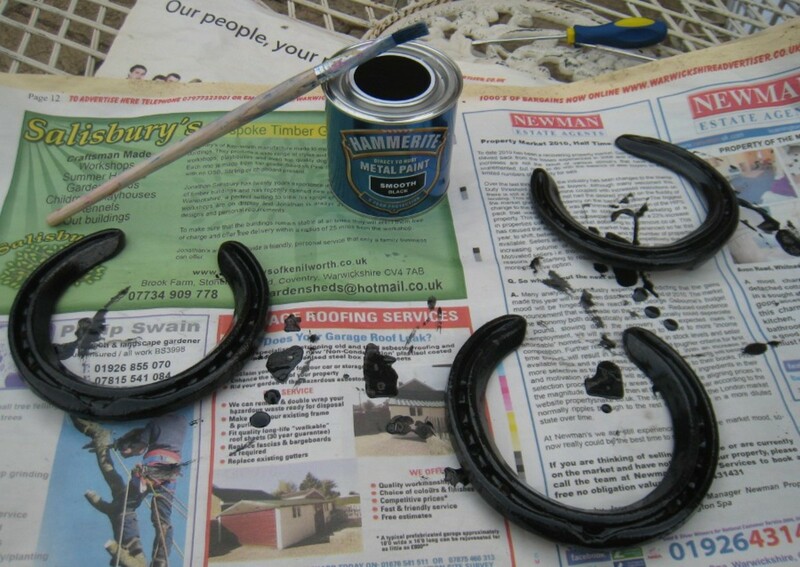 Painting horseshoes is simple, cheap, and great fun! Anyone can do it, no matter their artistic abilities. All you need are horseshoes and a few basic tools. 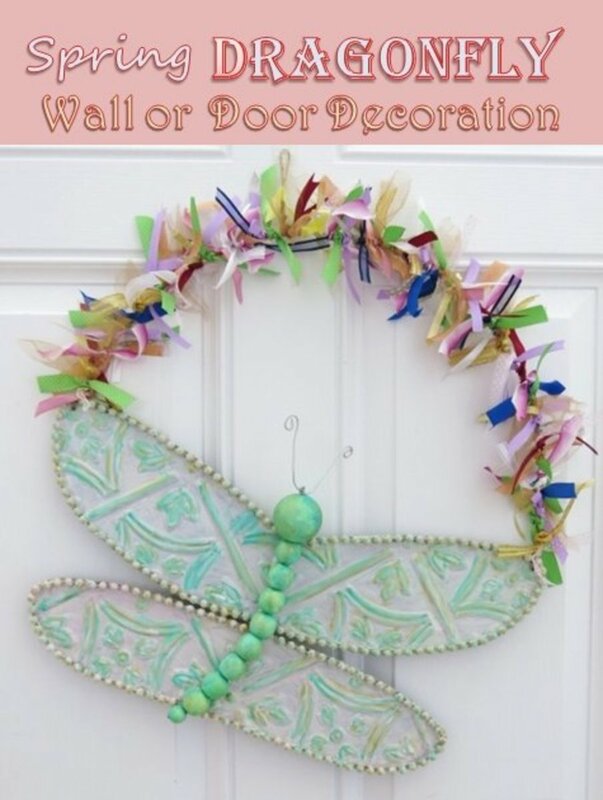 Here are the general steps to decorating one yourself! First, you'll need to find someone to supply the horseshoes. Farriers and blacksmiths end up with many old pieces and are usually happy to give some away. Sometimes, they might give you a whole bundle to use. 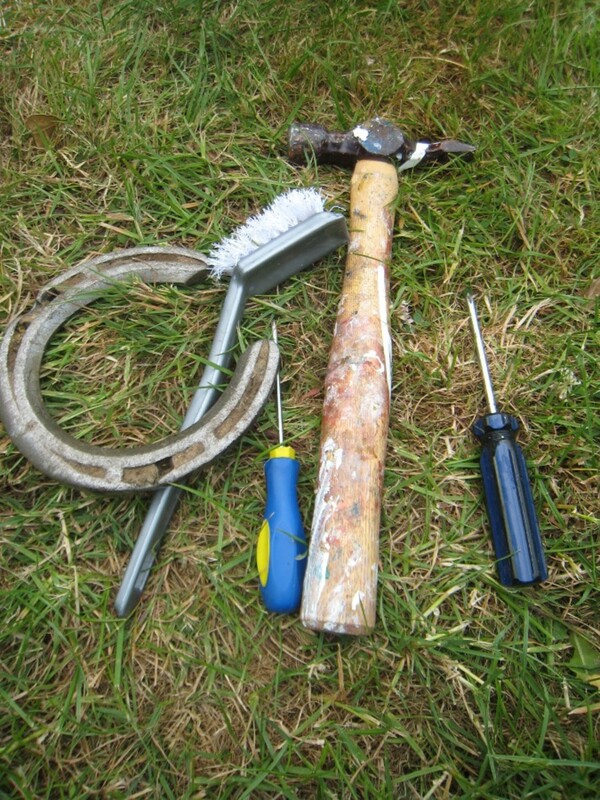 If you own a horse or know somebody who does, simply ask the farrier, someone who cares for and shoes horses' hooves, if you could have a few shoes to paint. If you don't know anyone, I suggest you visit the local riding school and contact their farrier. If that's not an option, search nearby or shop online to find a supplier. 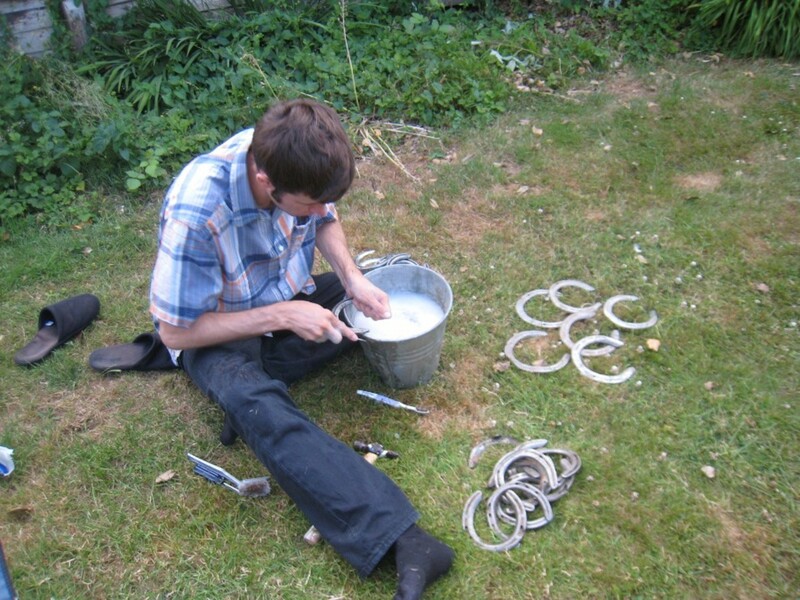 Once you get a few horseshoes to work with, it's time to start preparing them for paint. 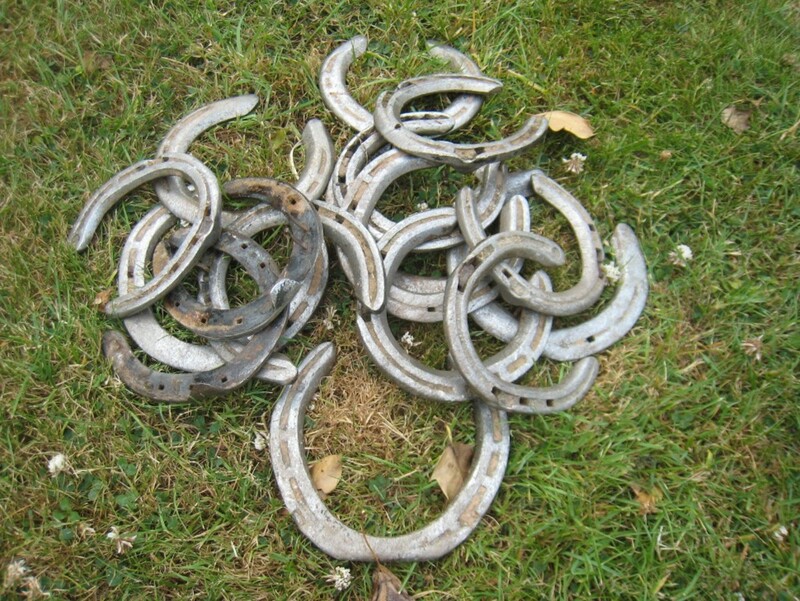 Used horseshoes often still have the nails attached, which go through wide holes that were already made in the shoe. You can sometimes wiggle them around a bit to make the nails fall out. If the nail still won't come out, place the shoe on the grass and use a hammer to knock them out. Prepare a bucket full of hot, soapy water. Place the shoe under the water and scrub it with a light brush. More dirt will come off, and the shoes will begin to look much cleaner. However, you may still find muck trapped inside the grooves. Use a brush to remove any large chunks of loose dirt from the shoe. Depending on the time of year and country you are in, the shoe will have different amounts of mud and dirt stuck. At this point, a lighter brush will suffice to remove any loose dirt. Horses weigh a lot. Each time they put their feet down, they exert a lot of pressure on the ground. This causes small stones and dirt to become firmly trapped inside the shoe that can't be picked out. The pebbles and mud often require more than a light scrub and some hot water to remove them. 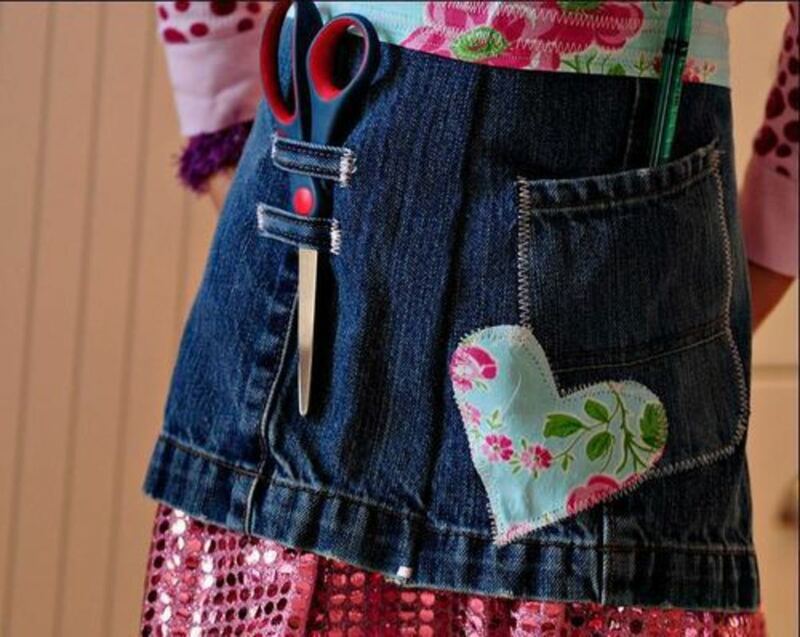 You'll need a firm wire brush or even a hammer and chisel to pry them out of their hiding place. 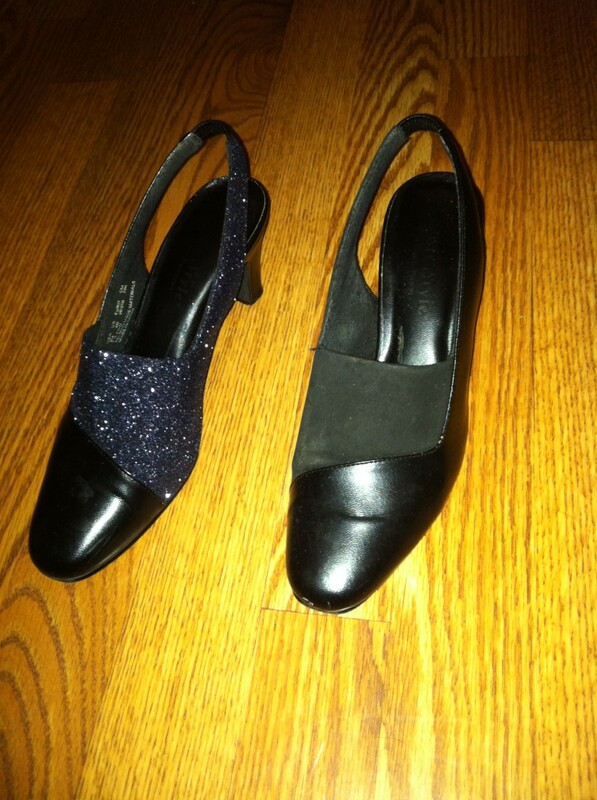 Spend a good while ensuring that all the debris is removed from inside the grooves of the shoe. Then, rinse them thoroughly. 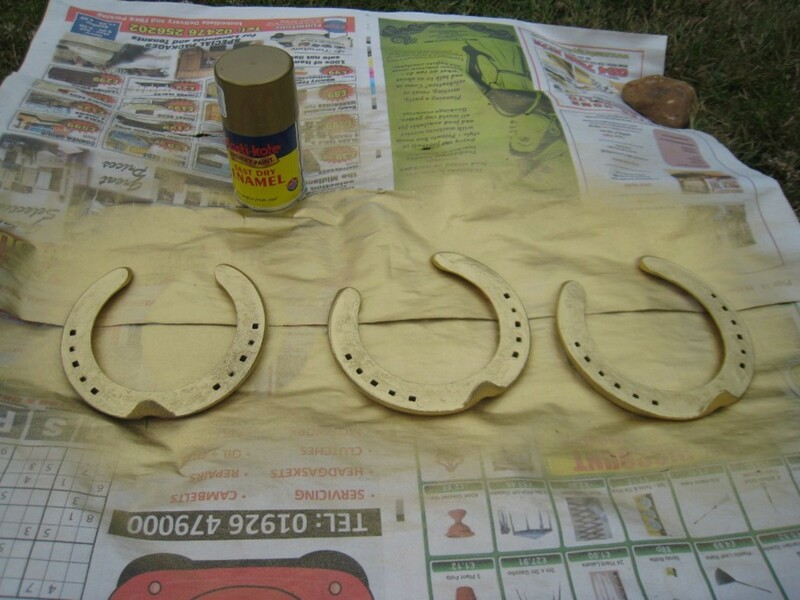 Doing this ensures that there is a smooth surface inside the horseshoe for the paint to stick to in the next few steps. Emulsion Paint: If the final project is to be used inside, emulsion paint is a product commonly used for home walls and is a good option. 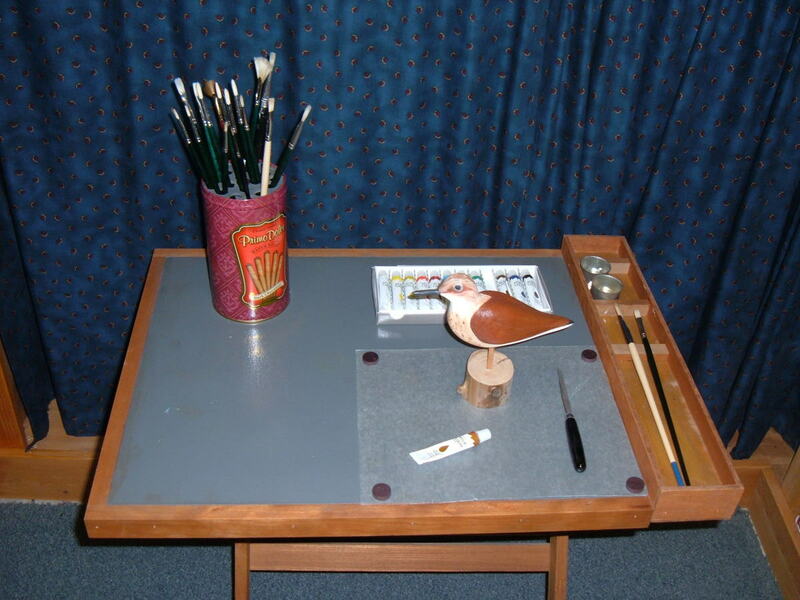 Acrylic Paint: This paint type also works well for indoor use. 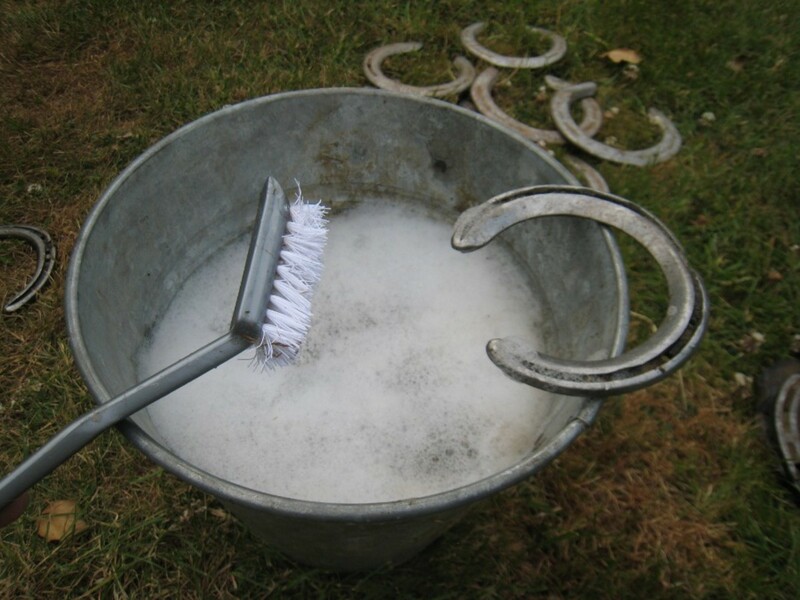 Rust-Resistant Paint: Use a paint that resists rust for a horseshoe placed outside. Spray Paint: The easy application of spray paint makes this a great choice for the project. Ensure the shoe is dry. Cover a surface in old newspapers and lay the shoe on top. For the first base coat, use a strong, thick artist's paintbrush. Apply the paint evenly across the shoe and ensure all the grooves and crevices are filled. 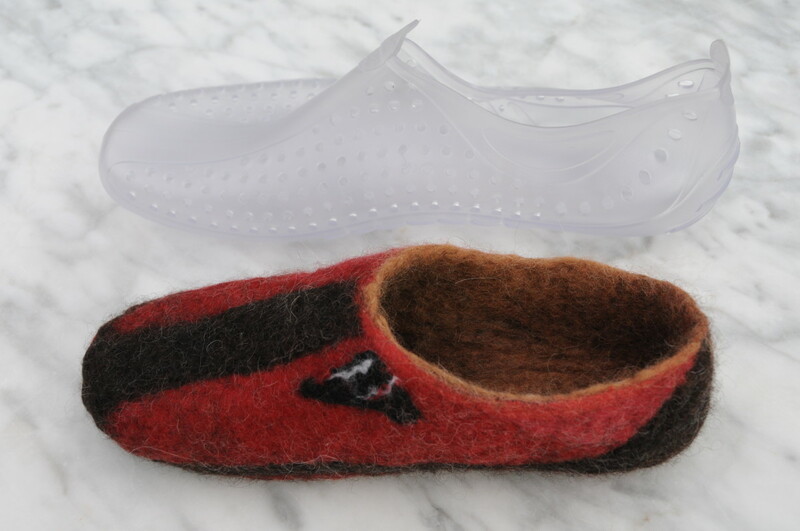 Allow a few hours for the first side of the shoe to dry. Then, turn it over and paint the other side. When both sides are dry, paint a second base coat if you see uneven patches. If you spray paint the shoe, it's sometimes easier to hang it from a strand of string so that every part can be covered in one go. Make sure to do this outside, in a workshop, or in a studio because the paint spreads far and wide. Be careful if it's a windy day—you might want to wear goggles. 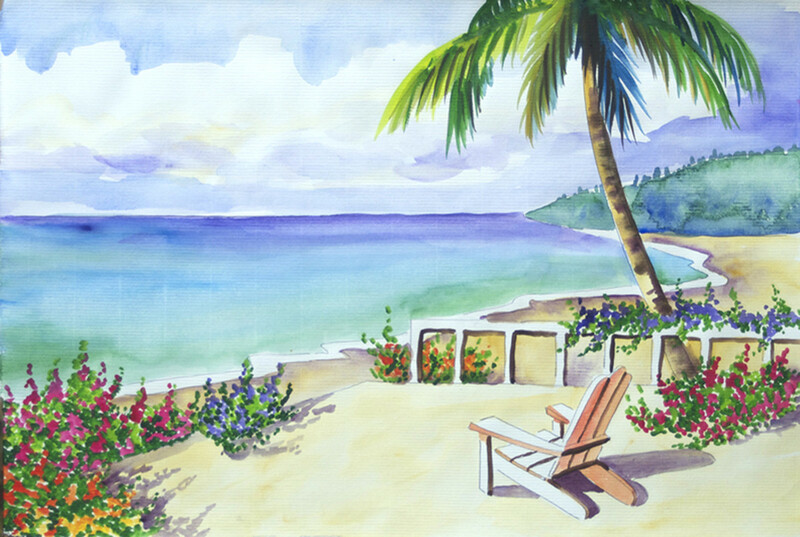 Use a finer artist's brush to paint on final decorations with acrylic paints. These could be flowers, names, house numbers, pictures, patterns—anything your imagination dreams up! Varnish the painted horseshoe to ensure it's protected and will keep its look for many more years. This is especially important if it's used outside, but acrylic paint can start flaking off over time even when indoors. What's more, varnish gives it a shiny finish. 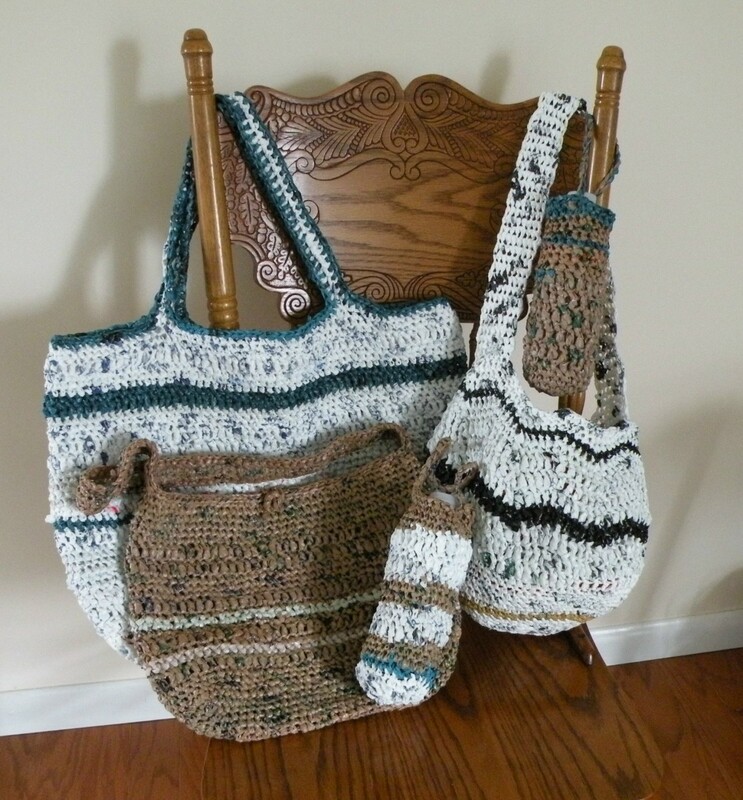 Stand back and admire your handiwork for a while. Show it to friends and family—they may ask you to make one for them. These horseshoes make great gifts for birthdays, anniversaries, weddings, and Christmas presents! good article, i forwarded it on to horse friends. What type of spray paint did you use? Mine won't stay on. Thx! Soak rusty shoes in straight vinegar, within 24 hours, rust falls off! 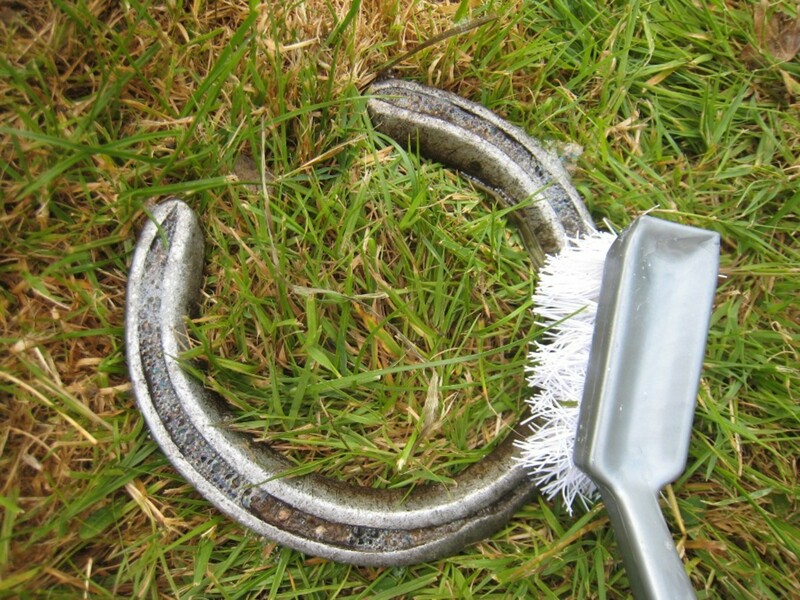 Better way to clean used horseshoes if really rusty and grubby. use a wire wheel. Thank you, marellen. The painted horse shoes look good on a mantle piece above the fire, too.